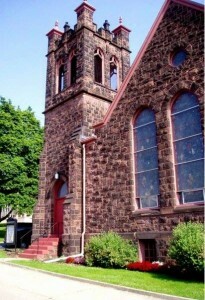 This beautiful building in Easton will hold its final worship service for Olivet United Presbyterian Church on May 10. That in a nutshell is what the Rev. Matilda Chase is trying to convey from the pulpit to the worshipers at Olivet United Presbyterian Church in Easton on a weekly basis these days. The reason for this message is that Olivet United PC is closing its doors for the final time on May 10 due to financial constraints. The once-vibrant church that had standing-room-only attendance with roughly 700 members in the mid-1960s has dwindled to a congregation that averages about 45 people on Sunday mornings. There are varied reasons for the dramatic drop in figures over the years. But even though the church will no longer have weekly services and programs, those who regularly attend should continue doing what they’re doing. And that’s the simple message that Rev. Chase is trying to get across to her parishioners. Hired to replace the Rev. Robert MacIntyre, who passed away in 2011, Rev. Chase came on board three years ago as the temporary supply pastor before being named the interim a year later. Attendance has dropped by about 15 in those three years due to deaths as well as other family situations that have pulled people away from the church. A lack of people has resulted in a lack of giving, lending to ongoing budget issues. In 2014, the church had to pull $20,000 from its savings account to pay its bills, and with that likely being the case again this year, the final decision to close was made in late February. A May 10 date, which also happens to be Mother’s Day, was picked as the last day because it coincides with the May 11, 1899 anniversary of Olivet United’s organizational service. Partly to blame for the decrease in people coming through the doors is the Easton area itself. A multi-cultural area that has become a blue-collar, working-class part of town is also home to extreme violence. In the week leading up to Easter alone, there were three shootings within three blocks of the church building. A community group was organized to approach the local police about the violence in Easton, and when Rev. Chase heard about the group, she approached the session at Olivet United PC about having a voice there. The reaction was telling. 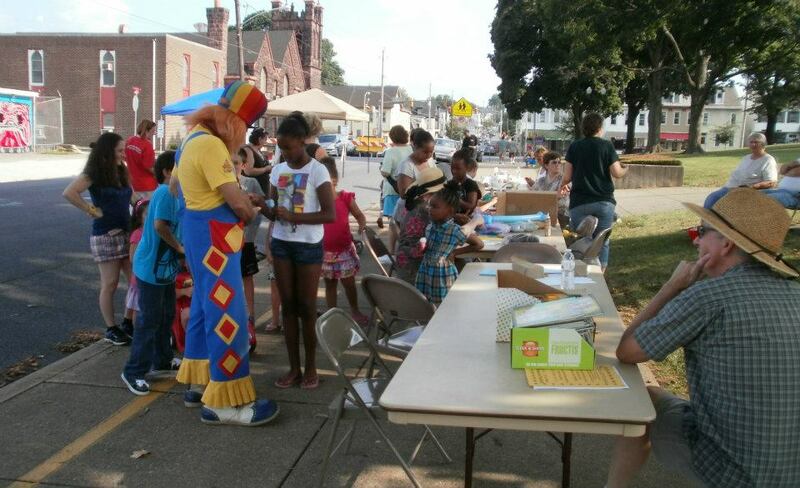 Among the activities Olivet United PC of Easton has spearheaded was a Festival Fun Night that was held on the street in front of the church building. 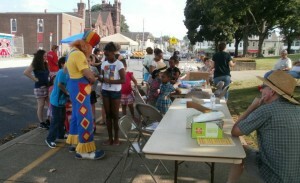 Another important time came when Olivet United PC considered upgrading its kitchen to help feed the hungry in Easton. The church received a grant from Lehigh Presbytery but still needed $55,000 to make it happen. The church voted on it and decided that it was too big of a leap of faith to take at the time. Discussions eventually ensued about the future of the church, and when all was said and done the church’s leaders agreed that closing would the best thing for everyone involved. Even though the church could survive for a little while longer, it was determined that Olivet United PC should shut down before the breaking point. “The worst thing we could do was just hang on until we couldn’t hang on any longer,” Rev. Chase said. “It’s the same thing with a person who’s dying. We’ve moved to the place where we recognize the benefit of Hospice care. People acknowledge that they’re dying, that they don’t deny it and that they do what’s important for them to do so that they’re being faithful and they’re being honest about what’s going on in their life. At the request of Rev. Chase, a Hospice preacher delivered a sermon in February titled “Live Until You Die,” and that has kind of been the approach taken by the congregation in these final months. Each Sunday at the start of the service, a “Minute of Remembrance” is held to allow people to reflect on an event or time in the church. Baptisms cropped up on Easter Sunday, and the church is holding a hymn sing so people can hear their favorite songs one final time. In late April, a history celebration that will include the presentation of old newsletters and bulletins will allow members to reminisce and is scheduled in conjunction with a pot luck meal. On May 3, the tradition of a Scottish communion will be held Sunday morning, followed by the final service the following week that will include a celebration of the resurrection of Jesus Christ. The Lehigh Presbytery requested a special afternoon service on May 10 to close the church, but the congregation did not wish to return to the building following the morning service. 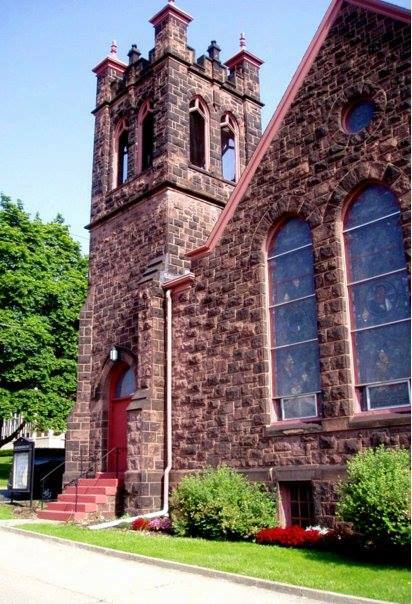 Where those same worshipers will end up the next Sunday remains to be seen, but there are two other PCUSA churches in Easton (First PC and College Hill PC) that could help fill the void. “And there are other people who are going to take this opportunity to go and do something really different,” Rev. Chase acknowledged. The closing of Olivet United PC will leave a hole in the lives of its worshipers and also in the Easton community. The church has been committed to mission work, having provided food monthly to a homeless shelter and local food pantry while also hosting two Alcoholics Anonymous groups and being the site for bi-annual community rummage sales. But the biggest void will come from the nursery school that has been under Olivet United’s roof for 40 years and is also closing May 1. “This nursery school has made a real difference in a lot of people’s lives,” the pastor said. Rev. Chase, who is moving to chair the Lehigh Presbytery’s Committee on Ministry to help churches that are in financial trouble find their way back to their feet before it’s too late, would like to see the church building continue to stay vibrant, maybe being a place of ministry in a community that needs it. It would help mask the feelings that are coming from a place and people who are going through a time of transition but should be confident in the things they’ve accomplished over the years.